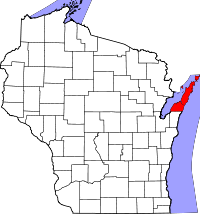 Door County, named after the dangerous strait between Green Bay and Lake Michigan nicknamed Death's Door, was organized in 1851 from Brown County. Vital records date from 1852, including births from 1852, deaths from 1856, and marriages from 1860. These older records, not uniformly maintained until 1907, are located at the Wisconsin Historical Society, with a statewide index. Records after 1907 are available at the Wisconsin Department of Health Office of Vital Records in Madison, by mail, fax, or in person, for $20/copy, or online through VitalChek. Record copies are also available locally at the Sturgeon Bay Register of Deeds, with divorce records from the Clerk of Court.